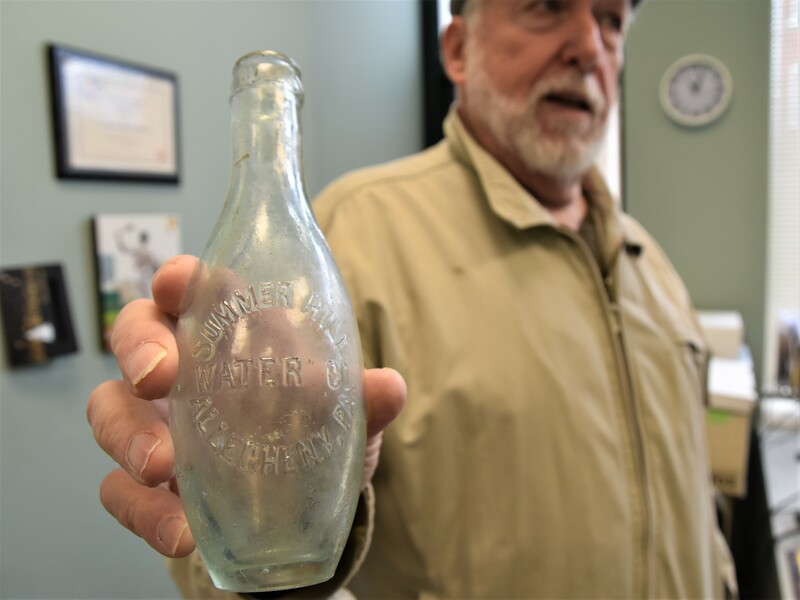 John Canning holds a bottle embossed with the words “Summer Hill Water Company.” Canning learned about the history of Summer Hill when he was a substitute mail carrier in 60s. Summer Hill: What’s in a name? As a summer substitute mail carrier in the 15214 “Observatory” Post Office, located at Perry and East in the early 1960s, I learned a great deal about the neighborhoods served from that office. In those days, the far edges of the city were in the process of significant new housing developments, including plans for the massive development of Northview Heights as a home for families to be displaced from parts of Manchester, Woods Run and the East Street Valley. One postal route even took me to outer sections of the community now known as Summer Hill. A few years ago I came across an old bottle embossed with the words “Summer Hill Water Company – Allegheny PA.” (Coincidentally, and to my surprise, it turns out that the water company was owned by my grandfather’s brother, but that is another story.) The real mystery was in the name: Where exactly was Summer Hill? Most of the present Northside neighborhood of Summer Hill was never part of Allegheny City. The western section was part of Ross Township, annexed to Pittsburgh in 1929, and the eastern section was annexed in 1931 from portions of Reserve Township. But the term “Summer Hill” dates back to the mid-1800s when more than 100 acres of land were purchased by William Hazlett, thus Hazlett Street, connecting his farm with the Allegheny/Perrysville Plank Road. This road was sometimes called “Butcher’s Run Road” and is now East Street. In February of 1823, Hazlett and his wife bought this tract of undeveloped land, established it as a farm, and raised a family of eight children. As Allegheny City expanded in the later decades of the 19th century, the properties of the Hazlett heirs were slowly transformed from farmland to residential use. They eventually became the 14th ward of the city, shortly before it was annexed to Pittsburgh. The “Summer Hill” name continued to be used in the early 20th century when it was recorded as the name of a 1905 development plan just beyond Allegheny City’s 14th Ward. When Pittsburgh expanded (a friendly annexation) into the southernmost sections of Ross and Reserve, the name went along with the merger. It continues to this day as Pittsburgh’s northernmost neighborhood.